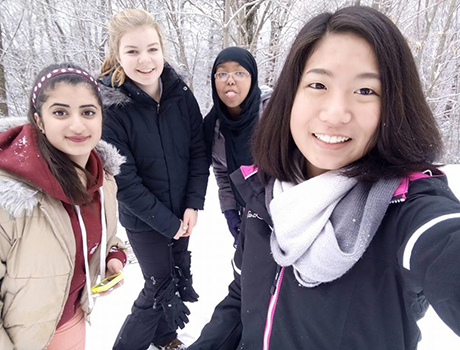 Daniela (YES, Palestine), Marisa (Germany), Shukri, and Fa (Thailand) are now experts on a sled! Winter with its snow has so far been a blast! Some of my fellow exchange students went sledding on a nearby mountain. Despite the fact that it was the first time for so many of us to see snow, we did great. It certainly was one of the coolest experiences we have had so far! In the photo, you'll see Daniela (YES, Palestine), Marisa (Germany), me, and Fa (Thailand)—now all experts on a sled!